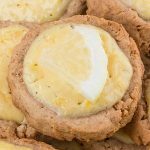 You will love this easy New York Cheesecake Cookies recipe from the scratch – crispy cookies topped with light refreshing cream cheese and lemon cream! 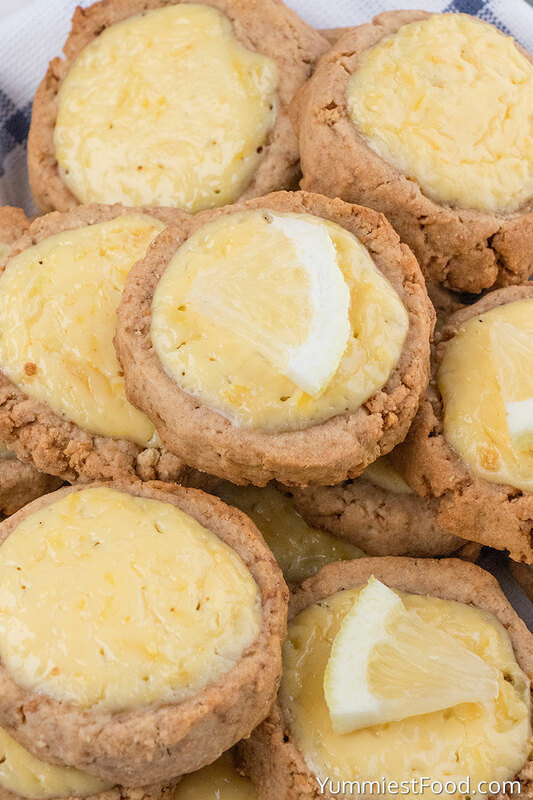 New York Cheesecake Cookies are a variation on the classic cheesecake recipe. 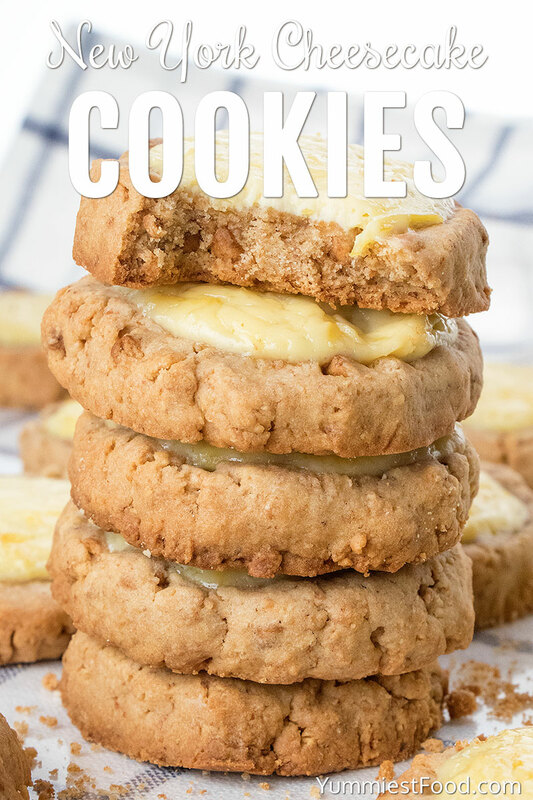 I love how crispy, chewy, thick and soft they are, and not to mention their creamy-lemon-cheesy filling! My recipe skips sugar at the faze of making the dough, as Graham Crackers already contain it. 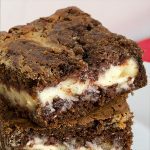 With a sweet topping, these are delicious and sweet enough! 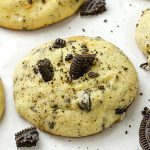 How Do You Make New York Cheesecake Cookies? You can do this recipe with Graham Cracker crumbs, or with Graham Crackers, as I do. Break the cracker into pieces, place in a food processor and pulse on and off until the crackers are uniformly crushed. This recipe calls for 11/4 Graham Cracker crumbs, what is about 16-17 graham cracker squares, blended. In a large bowl whisk together flour, graham cracker crumbs and baking powder. I used all-purpose flour, but white whole wheat flour works fine also. 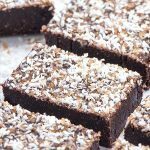 You can experiment with different types of gluten-free flour, except coconut flour as it absorbs so much more liquid. Using an electric mixer, in a medium bowl beat together butter and egg white until well combined. As Graham Crackers already contain sugar, I skipped adding sugar at this point, as many similar recipes require. It is still delicious and enough sweet. Blend together these two mixtures until well combined. Set aside, and start to work on cream cheese filling. 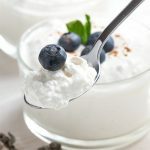 In a separate bowl beat together cream cheese, granulated sugar, lemon zest, vanilla extract and egg yolk until well combined and creamy. You can add a tablespoon of fresh lemon juice also, for more flavour. I used Philadelphia light cream cheese. Next, take your dough and roll it into balls. Using 1/8 cup measure spoon I made 24 balls. It is about 2 tablespoons of dough per ball (cookie). Place the dough on the prepared pan, flatten slightly, and with a teaspoon (or your fingers) make a small ball-shape dent on the top. Repeat with rest of the dough. Spoon the cream cheese filling into the indentations of the cookies. They are ready for the oven! 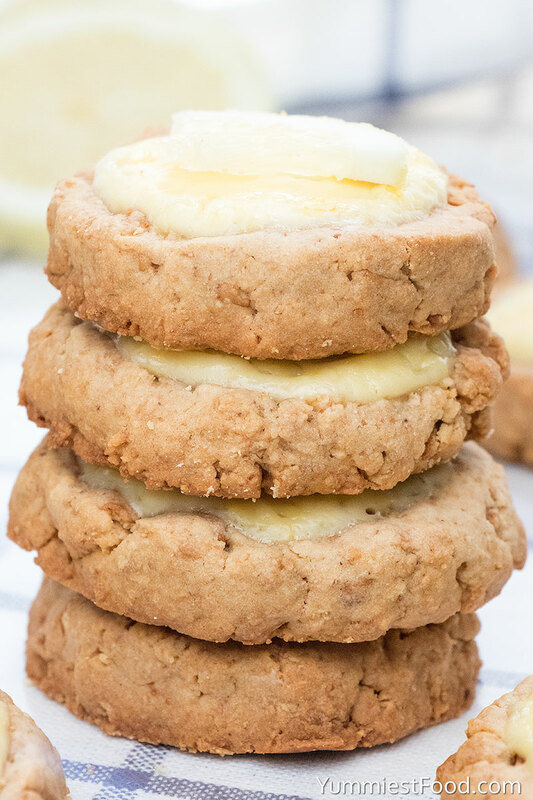 You will love this easy New York Cheesecake Cookies recipe from the scratch - crispy cookies topped with light refreshing cream cheese and lemon cream! Prepare a baking sheet with a parchment paper and preheat oven to 350 degrees F.
In a large bowl whisk together flour, graham cracker crumbs and baking powder. Using an electric mixer, in a medium bowl beat together butter and egg white until well combined. Add butter-egg mixture to graham-flour mixture, and blend until combined. In a separate bowl beat together cream cheese, granulated sugar, lemon zest, vanilla extract and egg yolk until well combined and creamy. 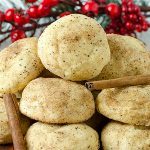 With ⅛ cup measure spoon (or roll 2 tablespoons of the dough to the ball), place the dough on the prepared pan, flatten slightly, and with a teaspoon (or your fingers) make a small ball-shape dent on the top. Repeat with rest of the dough. Spoon the cream cheese filling into the indentations of the cookies. 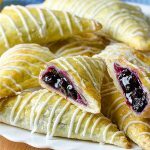 Bake for 10-12 minutes, until cookies become lightly golden brown and the filling on the top is set. Let the cookies cool a few minutes on the baking sheet, before moving them to a cooling rack. Nutrition calculated per 1 cookie (30g).